Today I will venture into a new country, Macedonia. Specifically, I will cover the costume from the region of Skopska Blatija, which includes the villages in the lowlands around the Vardar river just upstream from the capitol of Skopje. 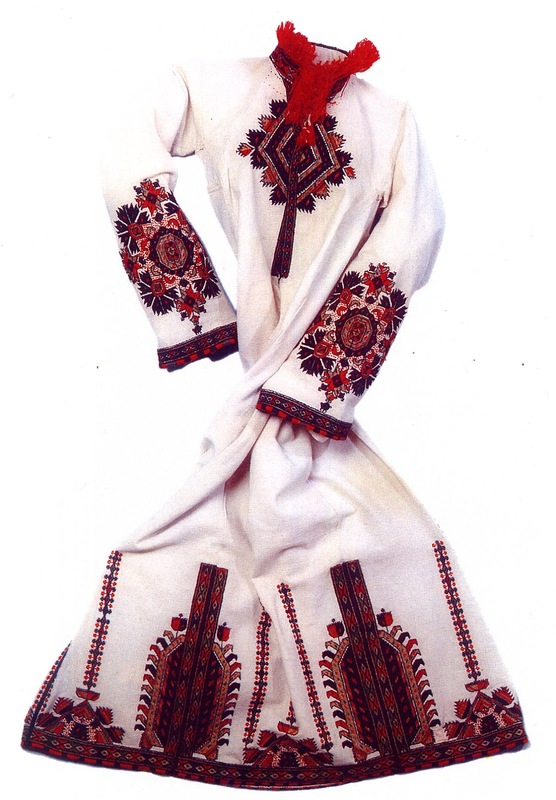 This is sometimes called 'the Skopje costume', and is often portrayed as if it was the national costume of Macedonia. 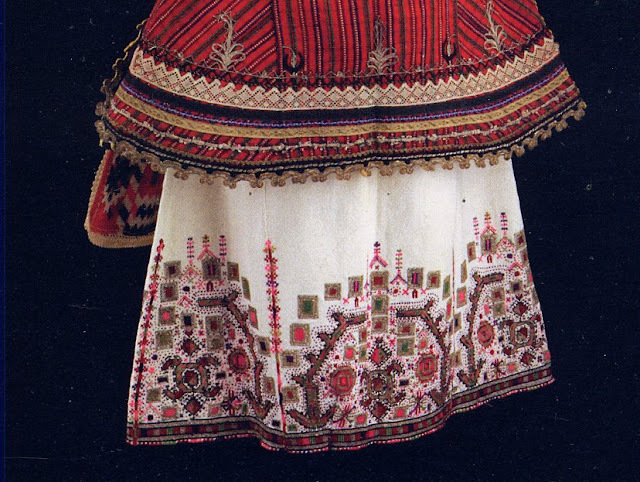 It is certainly typical of Macedonian costume, but it is actually native to this relatively small region. 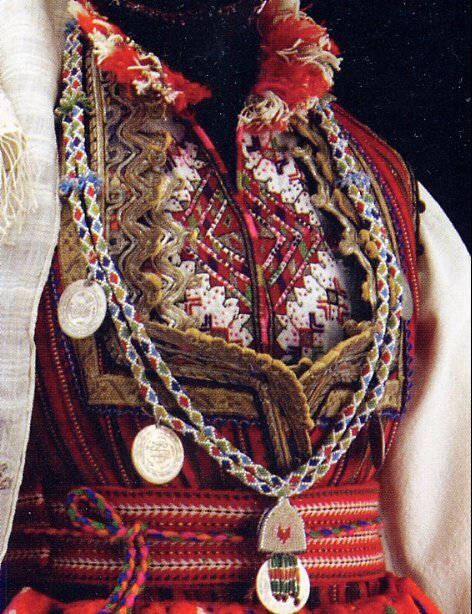 There is a second costume connected with Skopje from the highlands just north of this region, called Skopska Crna Gora, which is also very fascinating. Here is a closeup of this region. 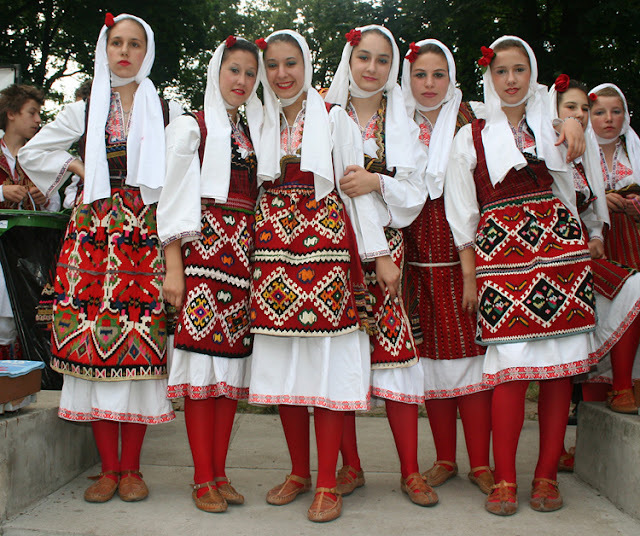 You may have heard of the controversy concerning the use of the name Macedonia. I will attempt to give a very short and I hope non-partisan history of the region. 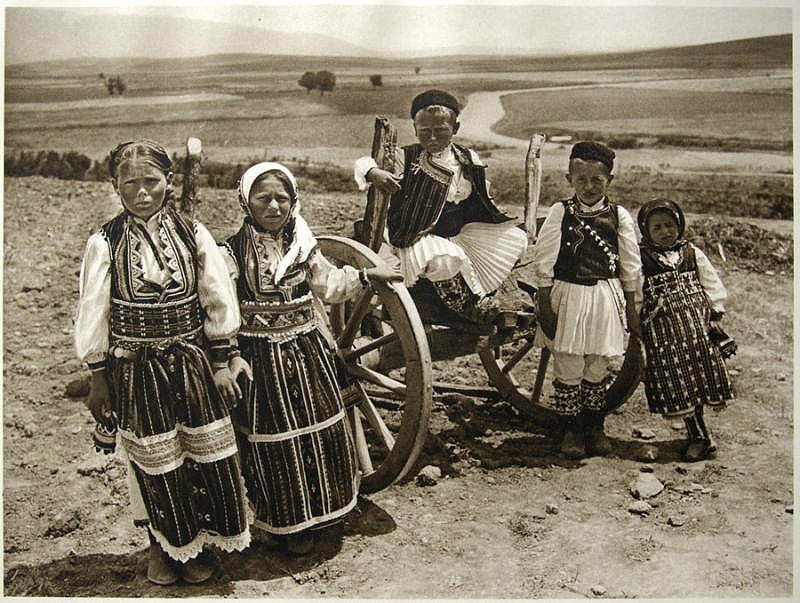 In Ancient times, Macedonia was one of the important nations of the Balkans. 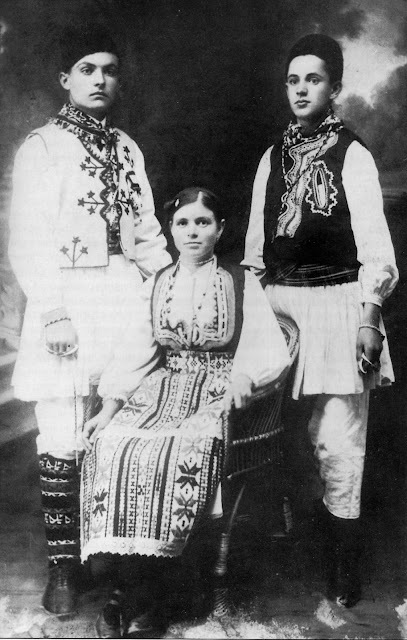 They had a language of their own, which is evidenced by the fact that young Macedonian men who attempted to participate in the Olympics were turned away and told that they could not compete because the games were not open to 'barbarians'. Now 'barbarian', in Greek Varvaroi, simply meant someone who did not speak Greek, who just went ' va va va' instead of speaking with words. This attitude is universal among humans, who each consider that their own language is real, while that of others is just a bunch of strange sounds. After the time of Alexander, Macedonia was considered to be an integral part of the Greek World. 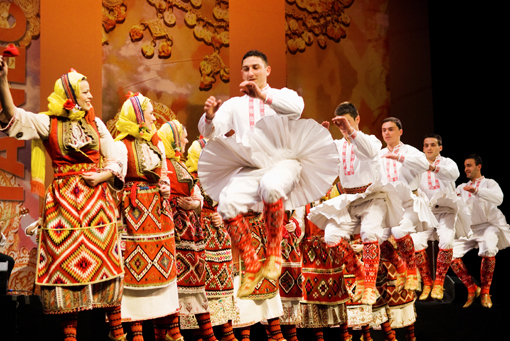 Slavic people entered the Balkans in the 5th cent. The current Macedonian language stems from that time. 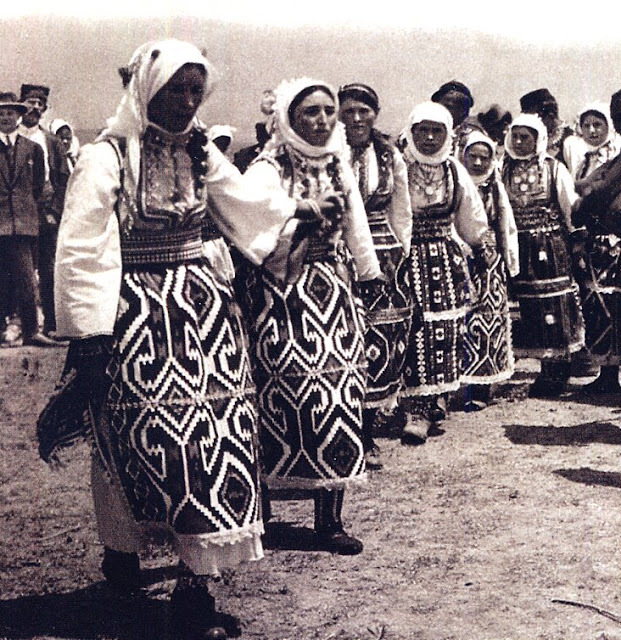 The region of Macedonia has informed the self-identity of the people living there, especially since the fall of the Ottoman Empire. 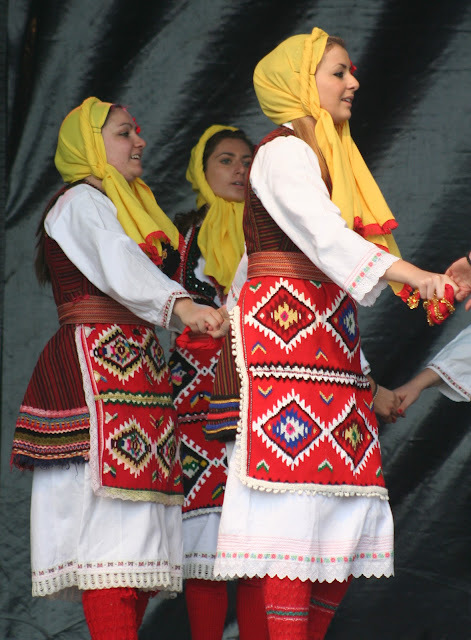 Many of the people who live there call themselves Macedonians regardless of which nation they live in or which language they speak.The traditional borders of Macedonia are currently split between three nation-states, The Republic of Macedonia, formerly part of Yugoslavia, Bulgaria, and Greece. 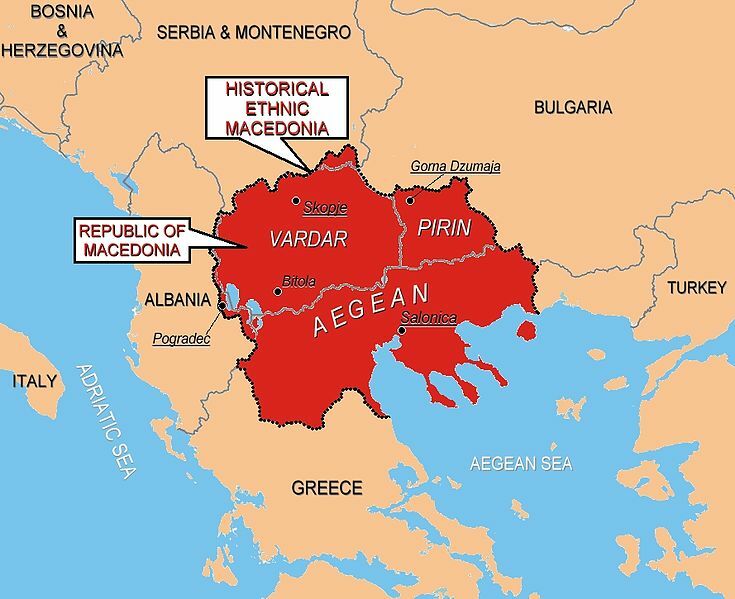 Often these divisions are referred to as Vardar Macedonia, Pirin Macedonia, and Aegean Macedonia, respectively, in an attempt to use neutral terminology. I sincerely do not wish to become embroiled in this issue. It is certainly the case that all of Macedonia has a certain similarity of culture, including music, traditional dance and costume. In any case, I will devote the rest of this article to the costume and embroidery of this one specific region. 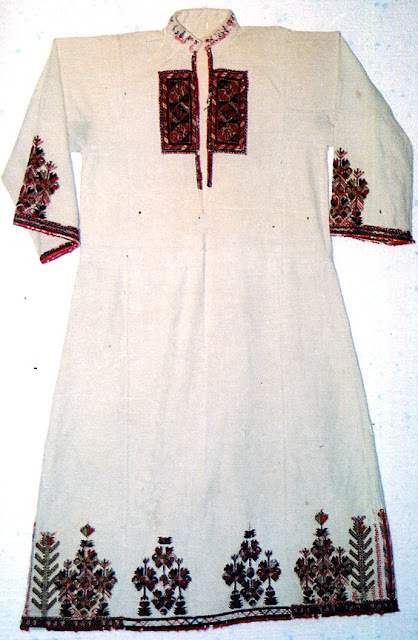 The basic garment here is the chemise, koshula. This is traditionally made of heavy linen or hemp. 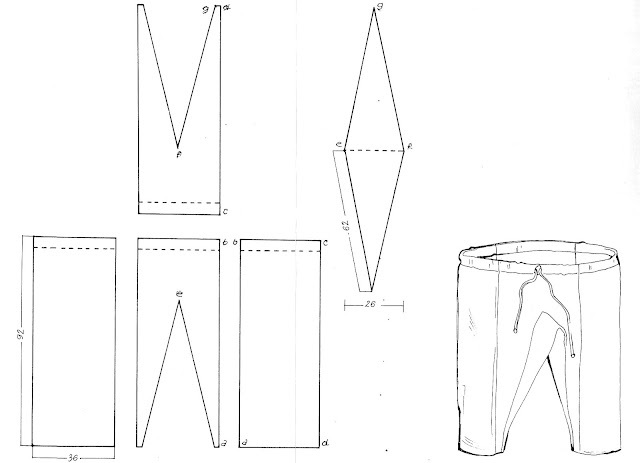 Here is a drawing of the garment. 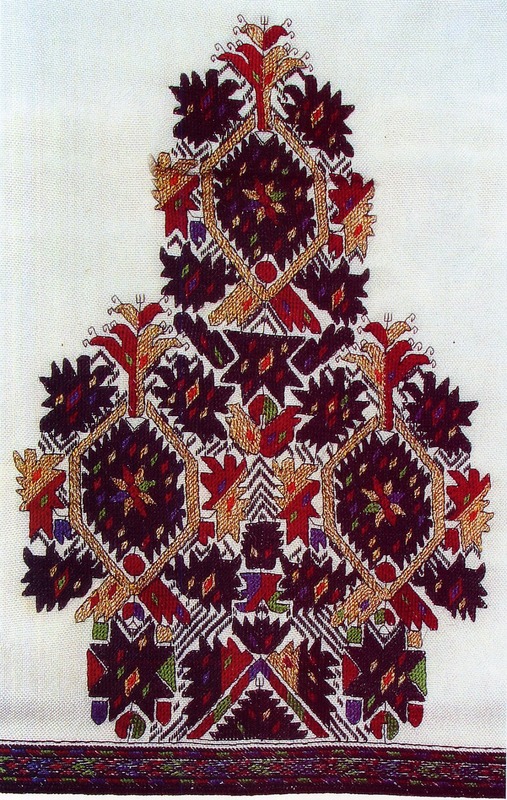 This cut is typical for Macedonia, and has obvious similarities to that of Dalmatia. 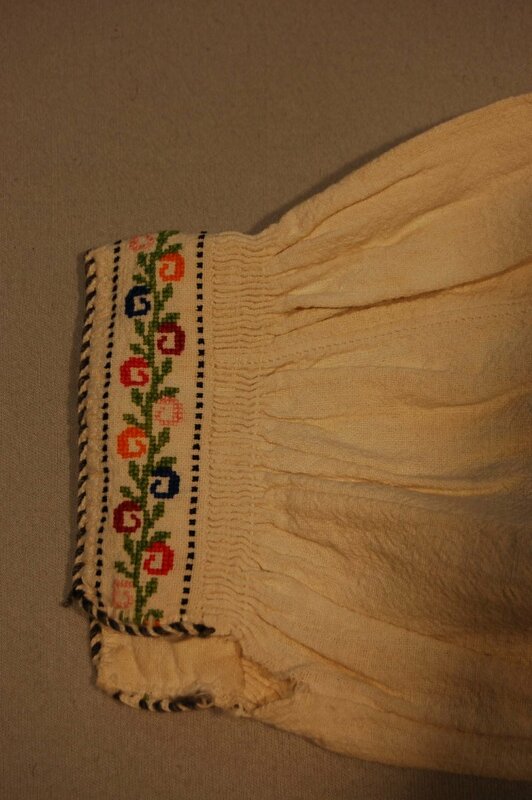 As you can see, there is embroidery on the hem, sleeves and front. 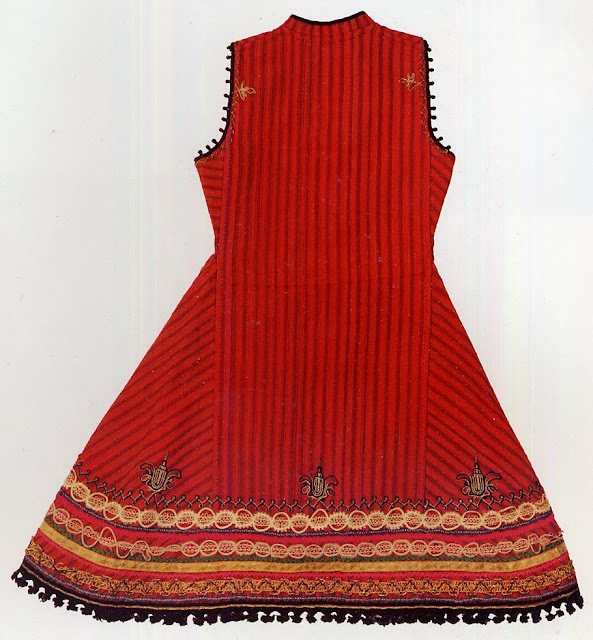 The basic colors used are black, red and gold with some admixture of green and blue. The motif known as '9 flowers' is often embroidered on the lower sleeve, and as you can see, sometimes repeated on the hem and front opening. 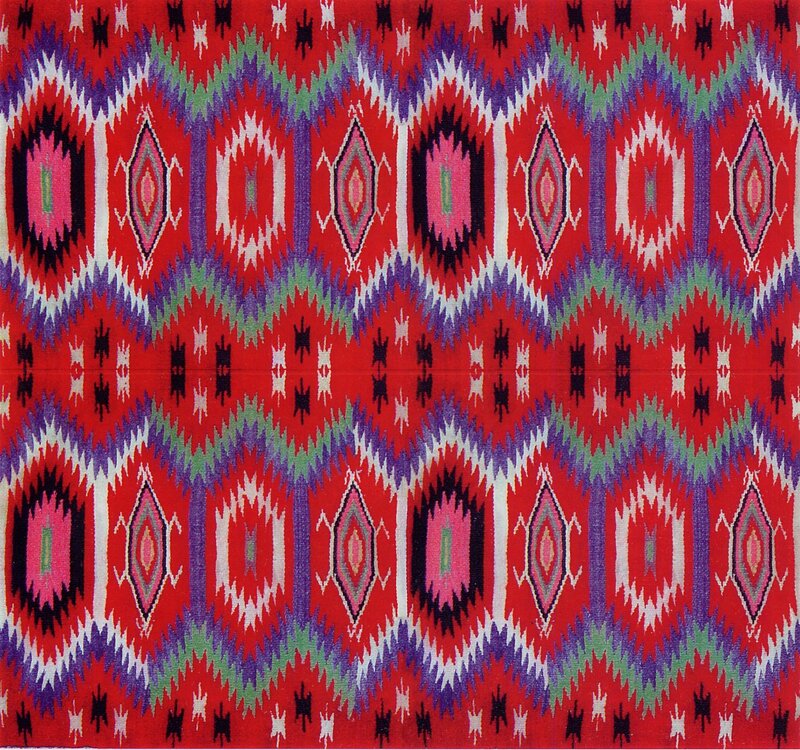 Here are a couple of variations of this motif. 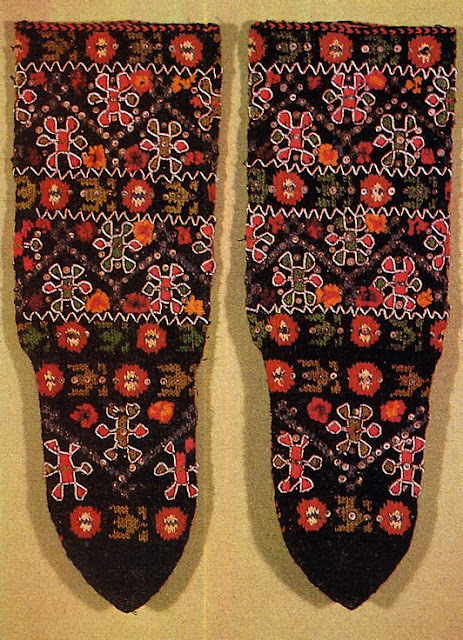 As you can see, the design is executed mostly in outline stitch and slant, or slav stitch. 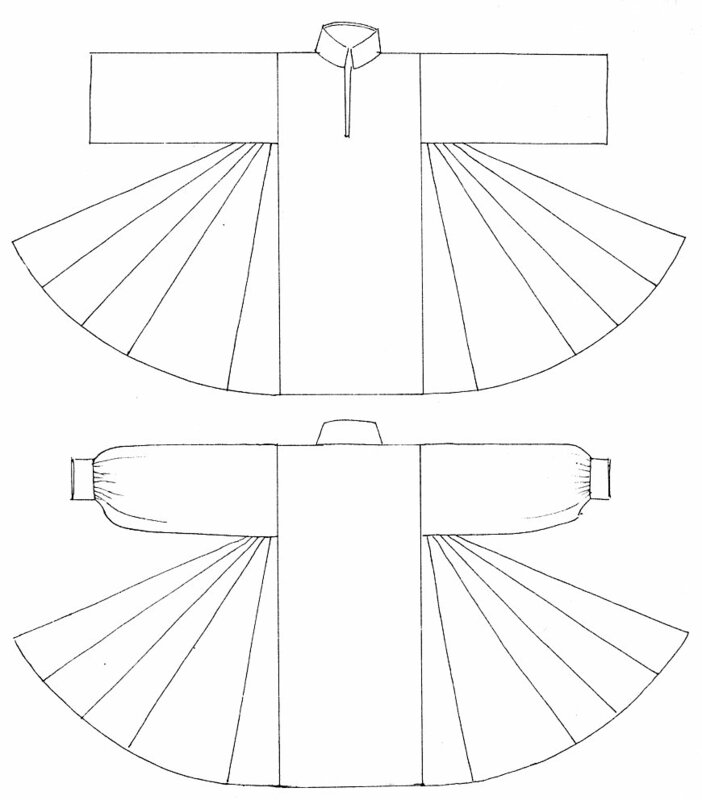 Sometimes the hem is executed in different designs, like the following examples. 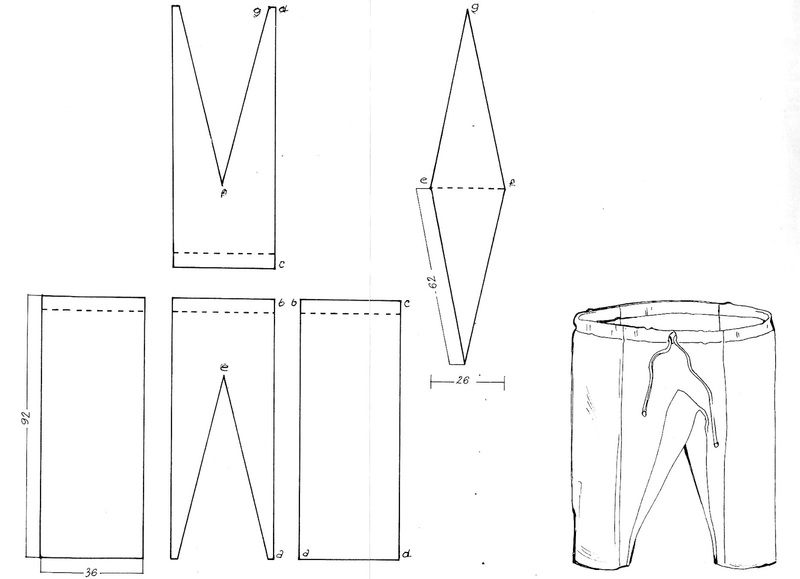 The design above the hem is often larger and longer in back, which is why this first example is twisted. 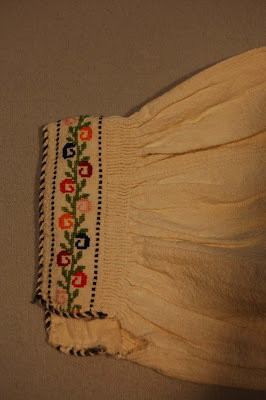 Here are some closeups of the embroidery on this koshula. 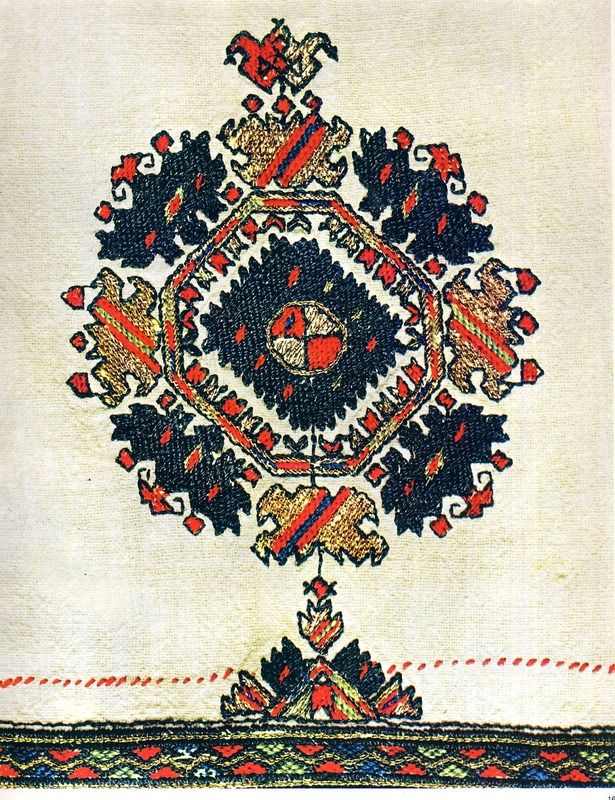 The embroidery is not always this extensive. Take a look at these examples, paying close attention to the embroidery of the hem. Here are just a few more examples of this style of embroidery. 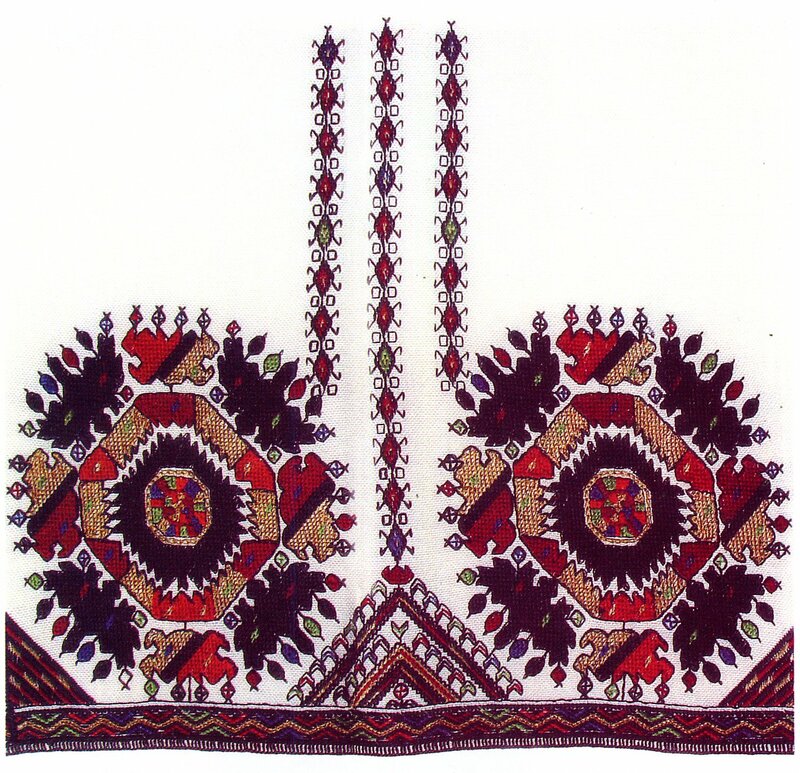 On some bridal outfits there is an attempt to add more embroidery, which results in the composition being lost. You will see some people today keeping these embroideries, even though the chemise is sometimes shortened beyond what I would consider an attractive length. 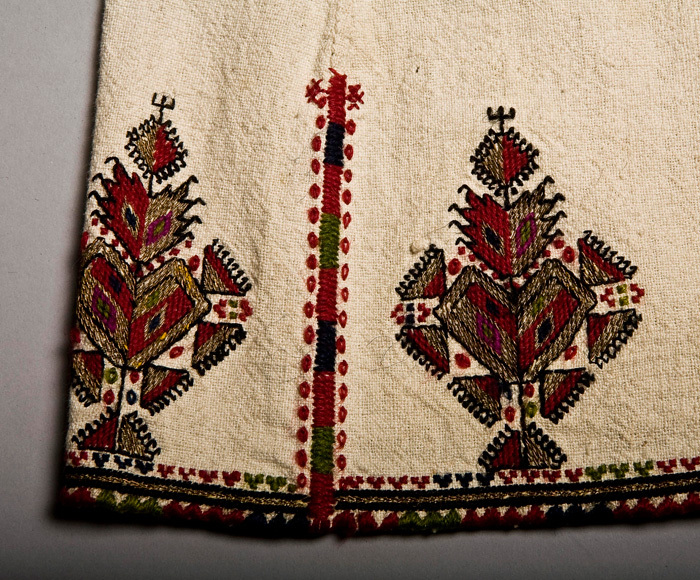 After World War II, sadly, the embroidery was replaced by lace, but is now making a comeback. 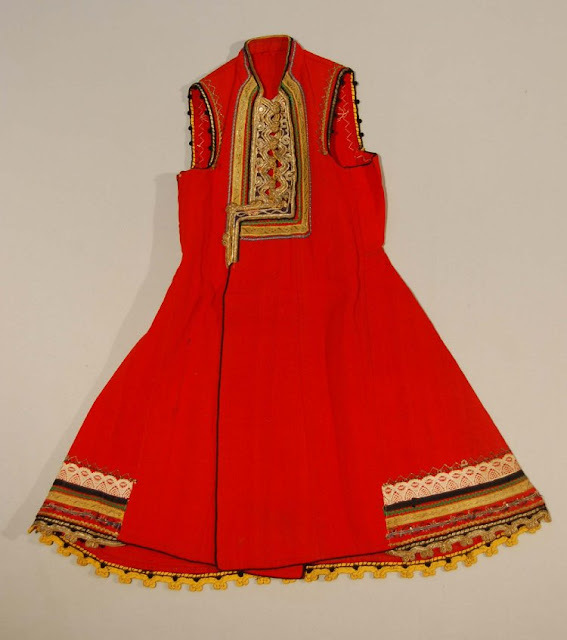 These performing groups often use thin flimsy material, and sometimes sew trim on the hem to approximate embroidery. 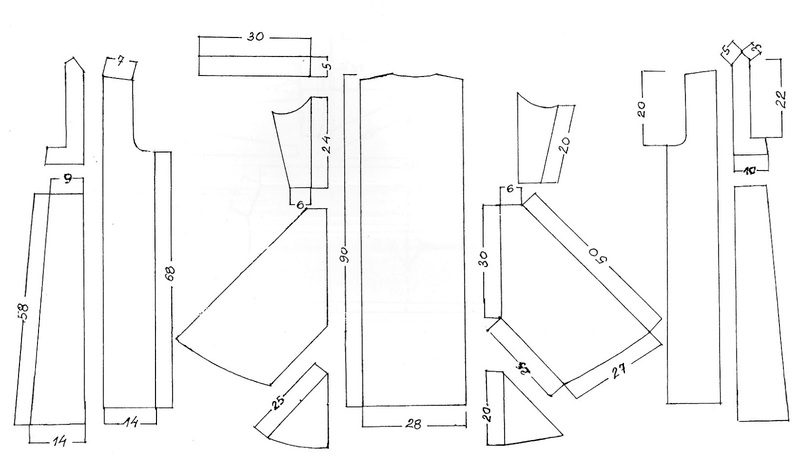 Again, both the chemises and aprons here have been shortened. 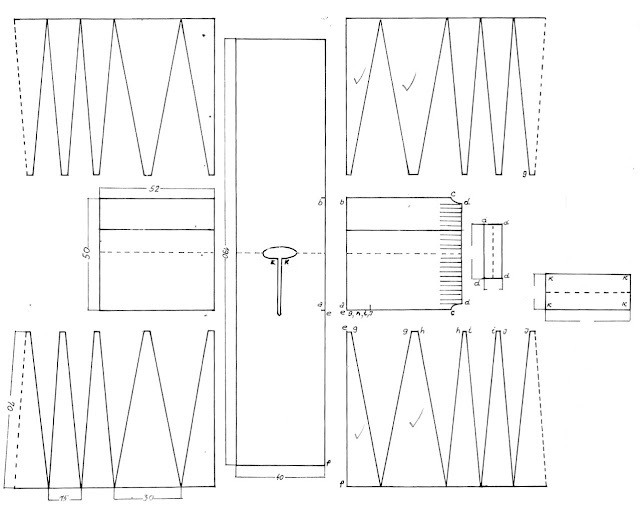 Prior to the 20th cent. 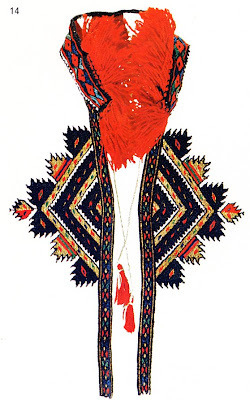 the women in this region wore a garment called saya over the chemise. 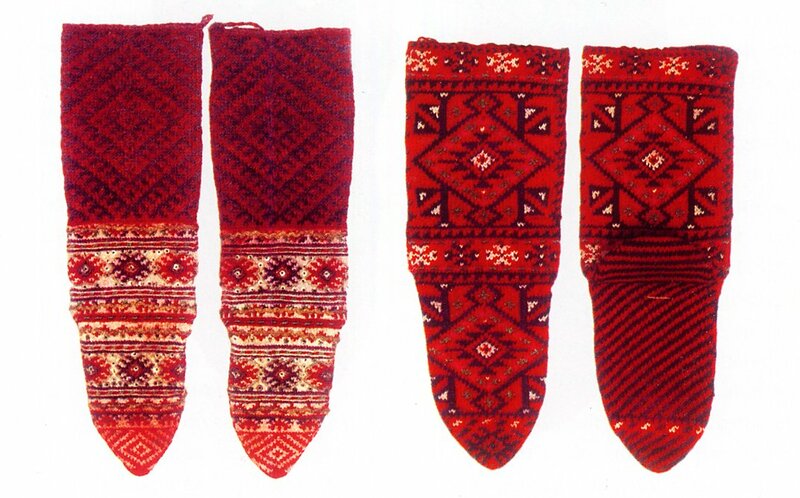 This is a type of long vest which opens in front. It was made of very heavy white home woven wool. 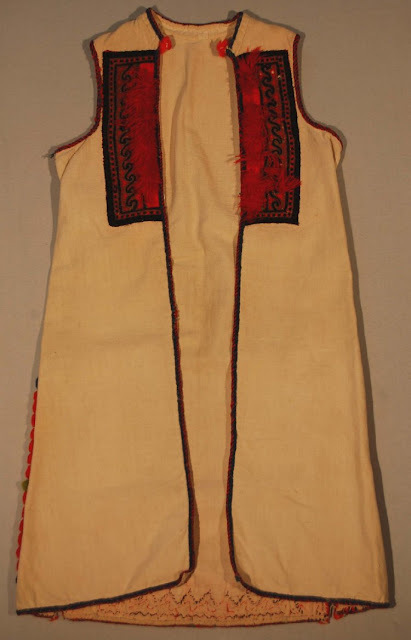 Over the saya was worn the apron and a sash, which held this garment closed. 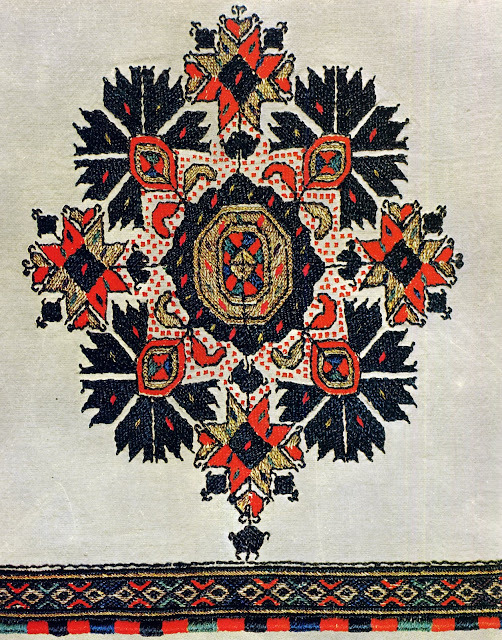 Those for more festive occasions were decorated with many pompoms. 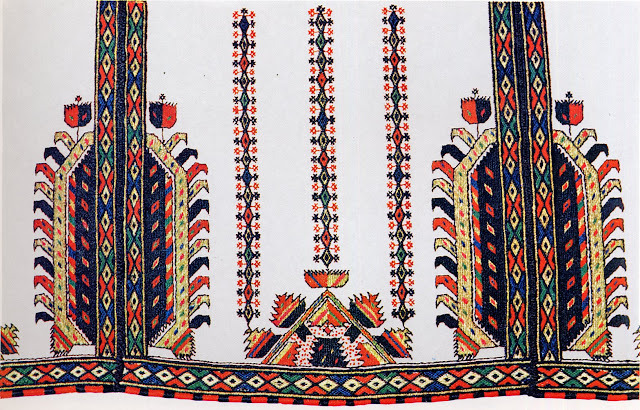 A second similar garment was worn over the apron and sash. This was called Kurdiya. Short detatchable sleeves were often attached to either the saya or the kurdiya for special occasions. 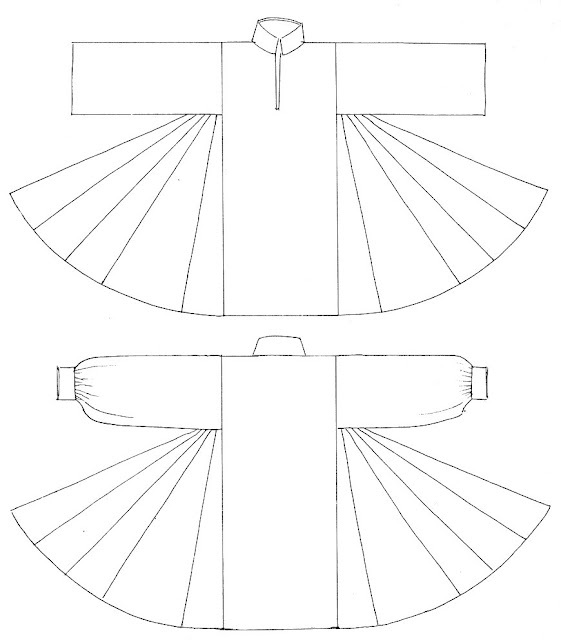 Practically speaking, the kurdiya is only distinguished from the saya by the lack of a gap of ornamentation around the waist. 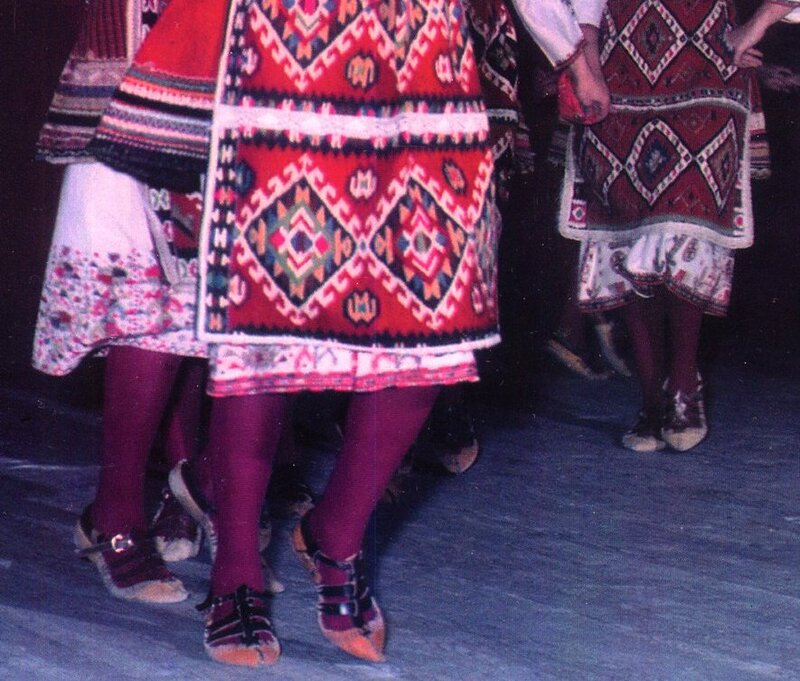 Here is a photo of a married woman wearing the full old costume. 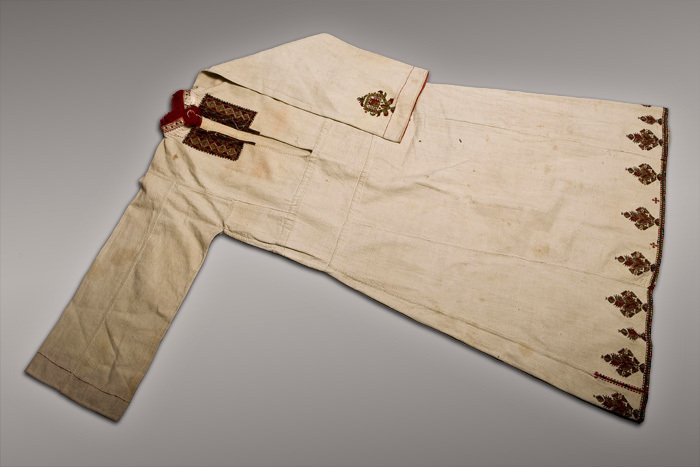 This has to some extent been retained as a wedding garment, but in general, was abandoned at the beginning of the 20th cent. in this region. 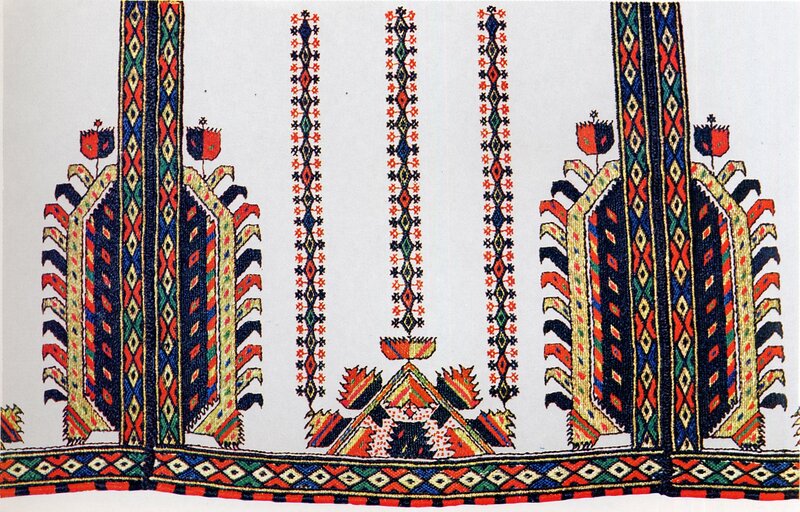 The garment which is currently worn is called elek. It has no sleeves, and has a cut out opening on the chest framed with notches which shows off the embroidery on the front of the koshula. 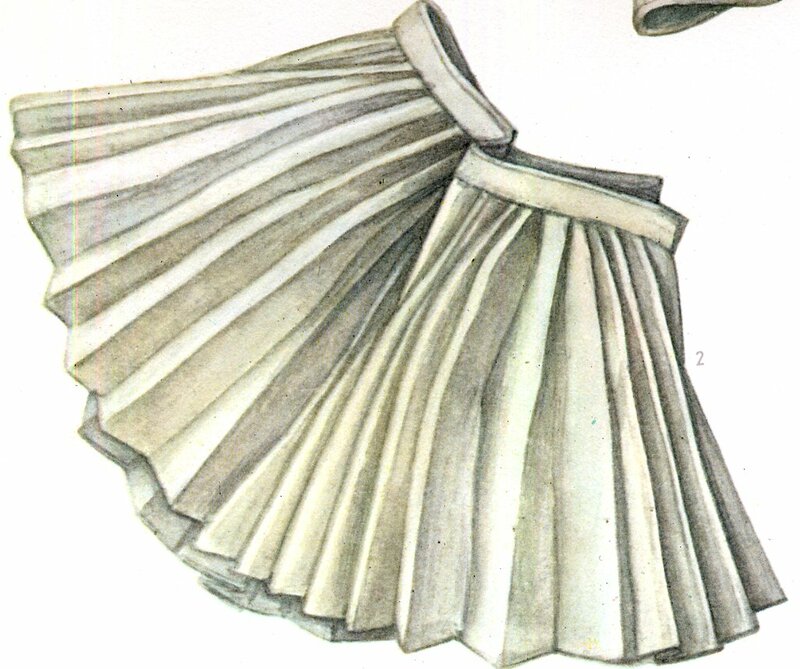 It overlaps at the waist, and is held in place by the apron and sash as the saya was. 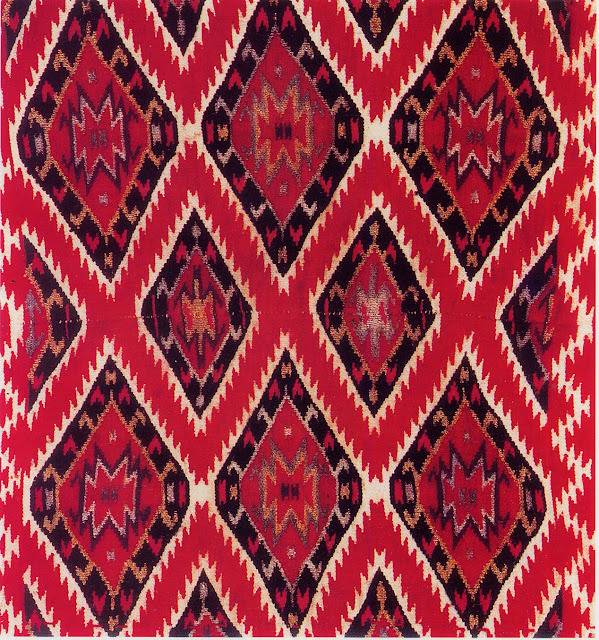 It is made of red wool, usually with a striped or plaid design in various colors called 'sharena', has several rows of braid galloon and lace sewn onto the edges, and wings at the hips.This cloth is much lighter than that used for the saya, but is still heavy and stiff by modern standards. The elek originally came to the knee, but is sometimes worn shorter today. Sometimes for special occasions, two of these would be worn, one over the other. The apron is made of two rectangular tapestry woven pieces sewn together, gathered at the top and trimmed around the edges. 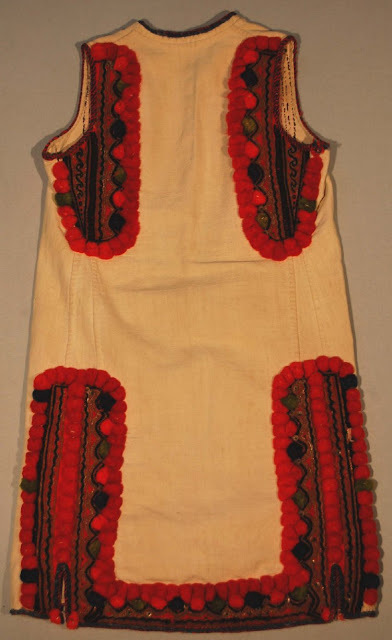 The basic pallette traditionally being red black and white with yellow and green used as minor accents. 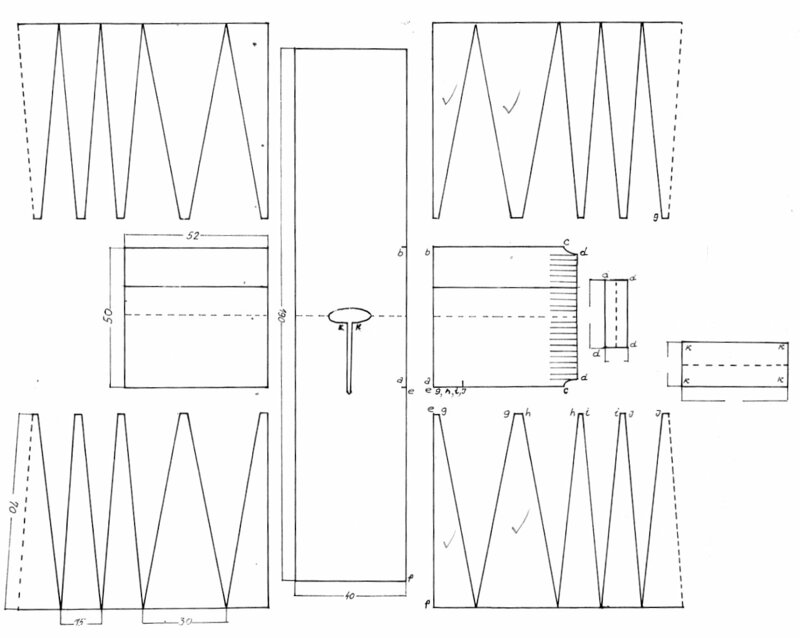 A variety of designs are used. 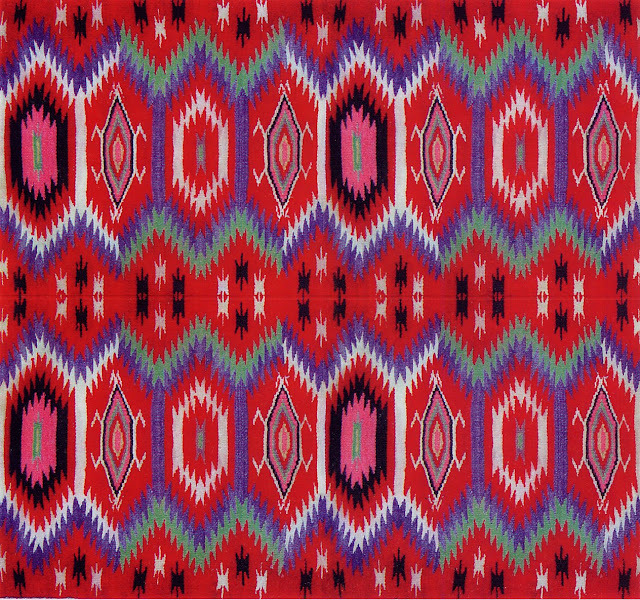 More recently, new colors such as pink have unfortunately entered the palette. 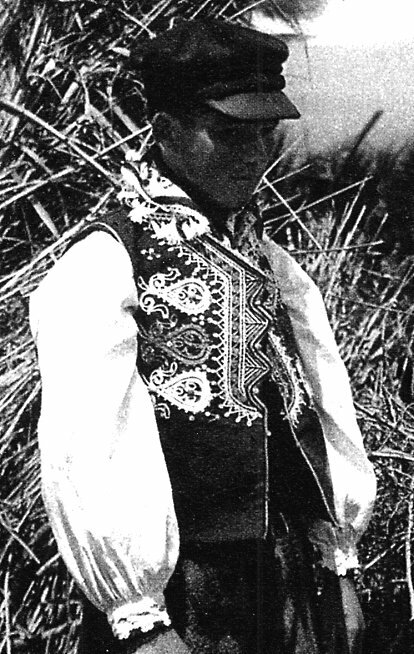 The hair is parted in two and then braided at the nape of the neck. 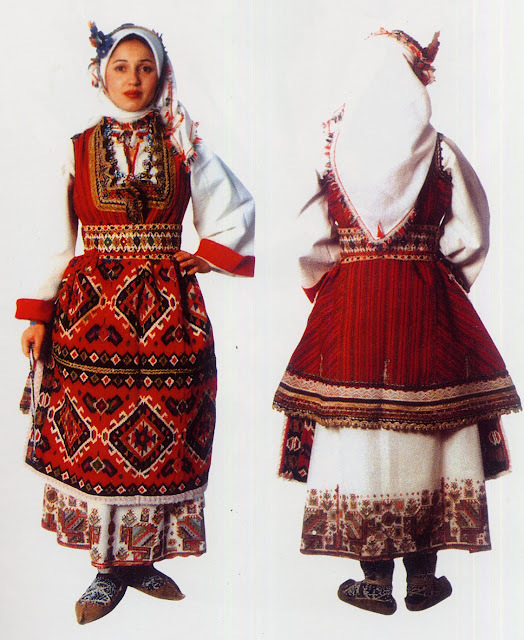 A kerchief, either white or yellow, sometimes square and sometimes long and rectangular, is tied around the head. 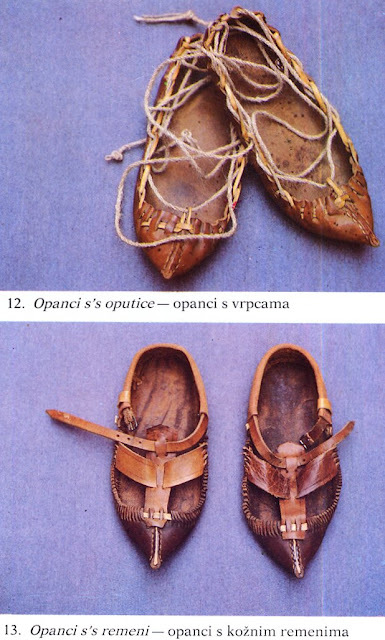 Over these are worn moccasins, called opanci, they are of two types, one closes with straps, the other is tied on with cord. 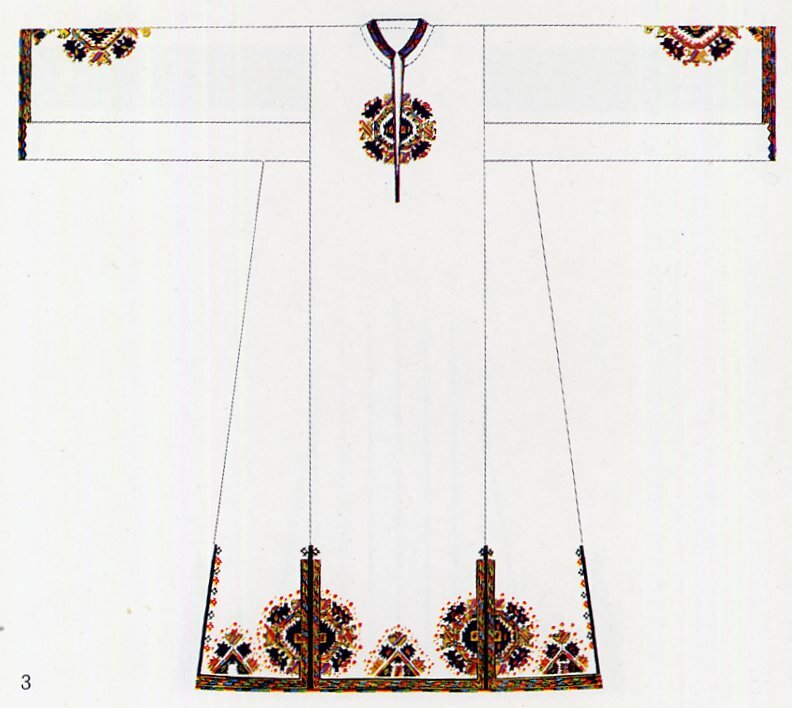 The men's summer costume, besides the stockings and opanci, consist of a shirt which is very full at the bottom, linen pants which are narrow in the calf and wide in the seat, and a wide sash, which holds the shirt in at the waist. A leather belt is often worn over the sash. This very full shirt looks rather like a foustanella. 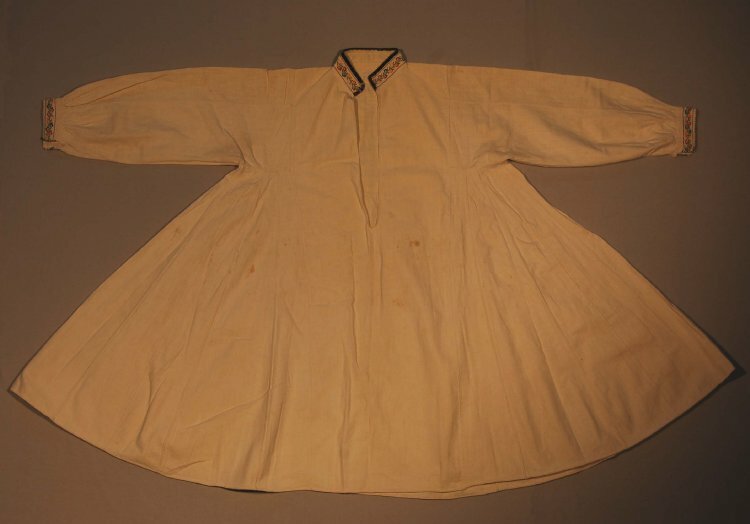 This can have cuffs, or the ends of the sleeves may be left open. Many Macedonian men's dances have twisting movements which are meant to show off the shirttails. 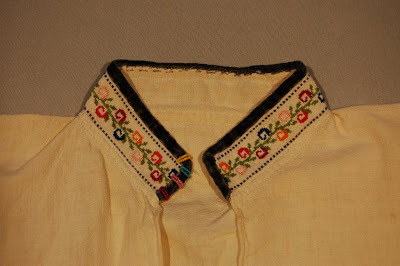 Sometimes there is simple embroidery on the cuffs, collar and front opening, as in this example from the collection of The British Museum. For formal occasions, or for dancing, a foustanella-type garment may be worn over the shirt. This is called v'stan. It adds a second layer and fullness. This may be seen in the videos at the end of the article. 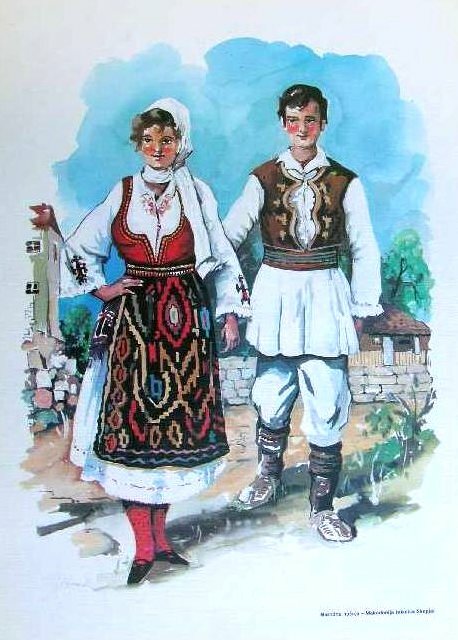 This never achieves the dimensions of the Greek or Albanian Foustanella, however. 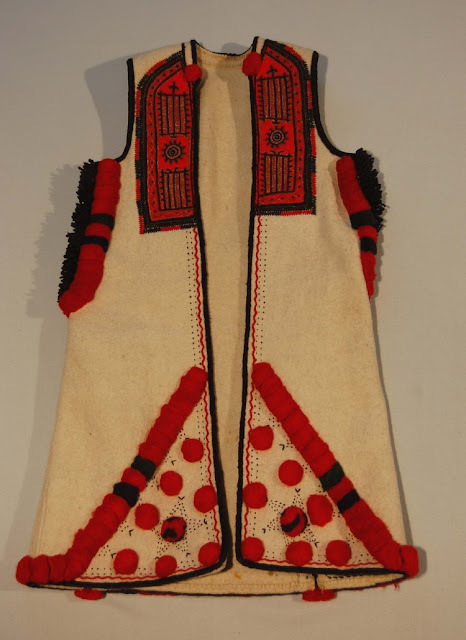 A vest is often worn with this costume, originally of the thick white wool used for the saya, and later of the red sharena used for the elek, or sometimes of another color wool. 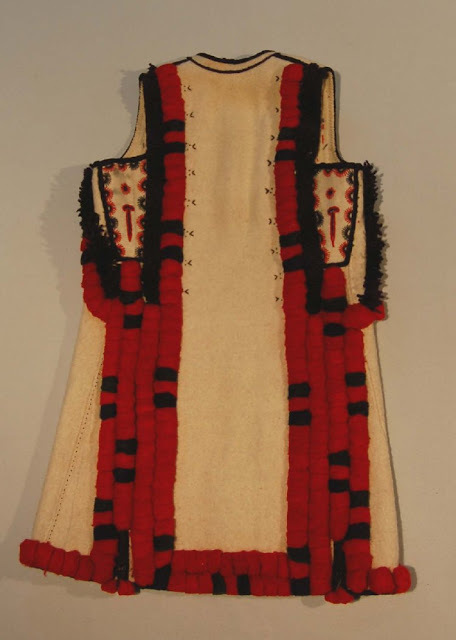 Here are views of both the old and the new style vest. Here are the cuts for both types of vest. A round lambswool hat completes the costume. This basic men's costume, with minor variations is found over most of Macedonia. A beaded ornament called kostek can be worn by both men and women. It is often draped around the neck and the other end tucked into the sash or a pocket. 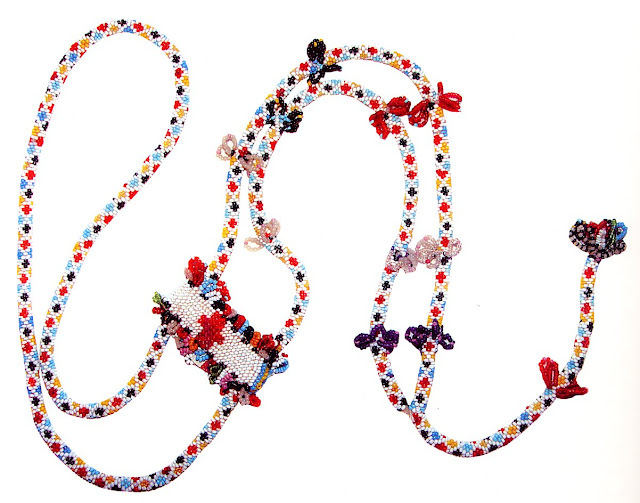 To me it looks like a home-made imitation of a watch chain and fob. There is a lot of variation in detail of this ornament. 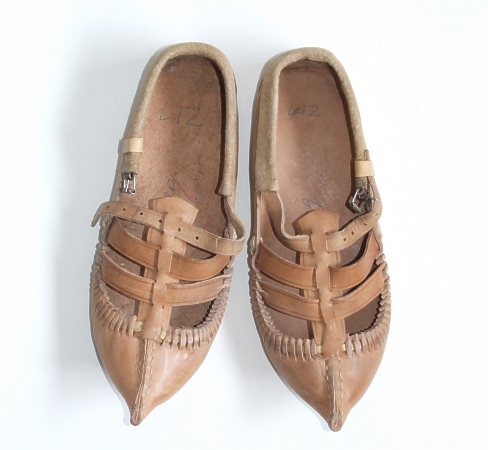 You can see it being worn in some of the images in this article. Just a few more images of this costume. 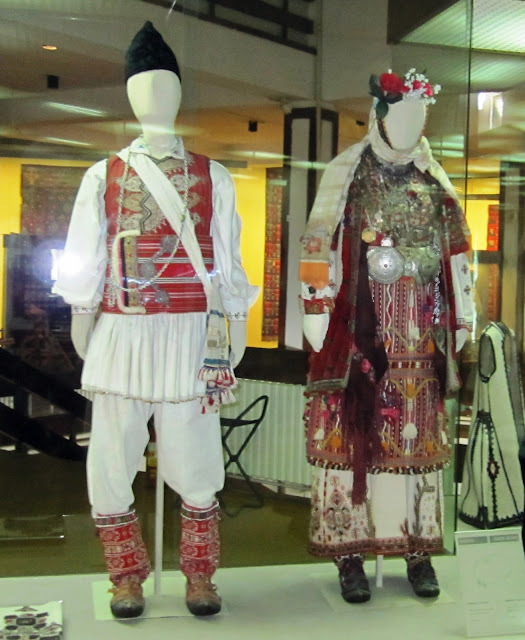 Here is a website which gives an overview of the costumes of the various ethnic subgroups of Macedonia. 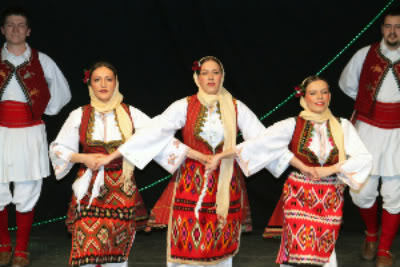 A couple of videos of the national Macedonian Ensemble Tanec. 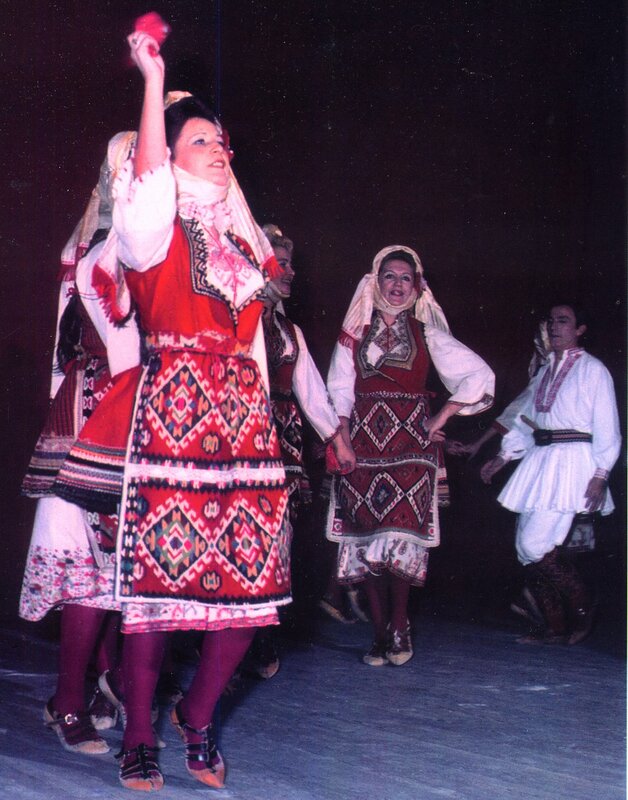 This one shows off the women's costume, and has some great singing, followed by some very good dancing. 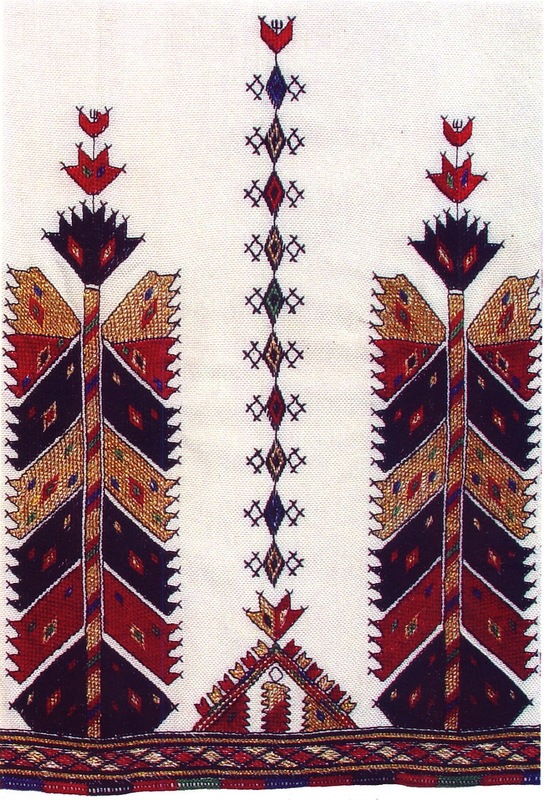 This also shows some of the asymmetrical rhythms so typical of the Balkan Peoples. The same ensemble doing a different piece, if you want to see more. 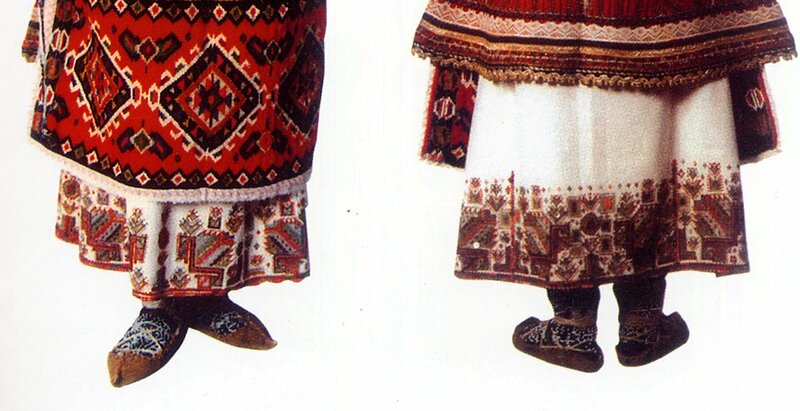 This one also has some good closeup views of the costume. The women and the men even more so, are wearing their hems shorter than is traditional. Stunning! So glad I found you on Twitter. 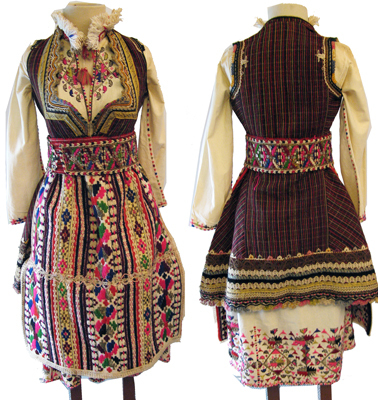 Do you know any places were to buy folk costumes? 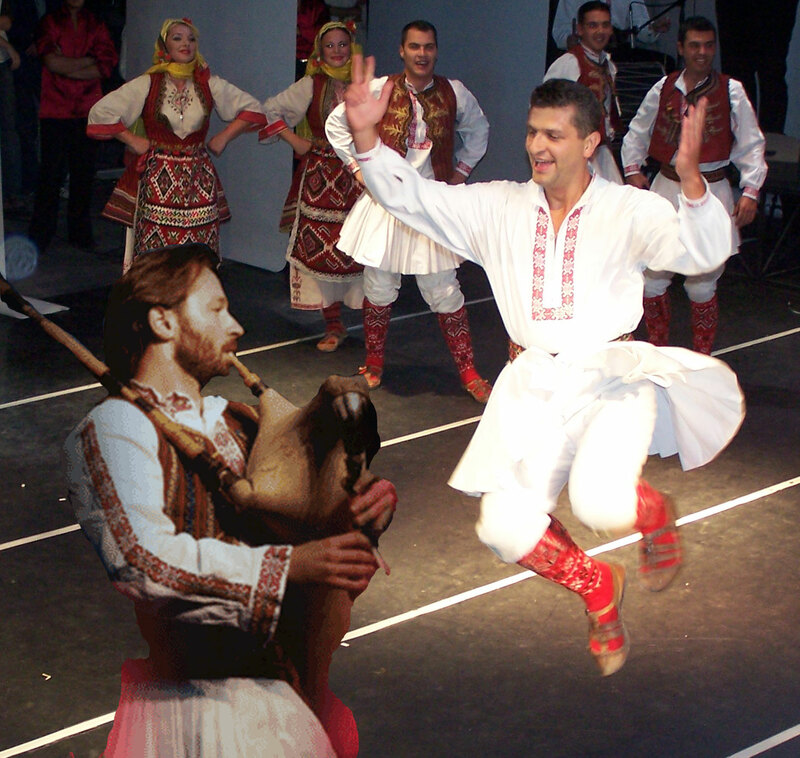 Inside and outside Macedonia? Unfortunately in Germany I don't have many sources to find traditional clothes. No, I am sorry that I do not know such places. Perhaps you could contact the local tourist office in Skopje. 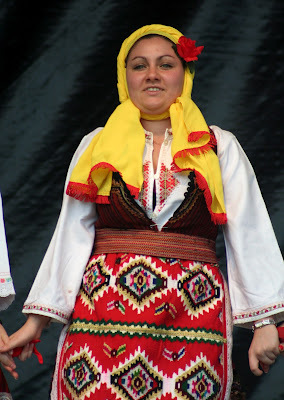 Hmm, although the website Balkanfolk.com has a couple macedonian costumes available. They mostly make Bulgarian. You can always do a websearch under buy Macedonian costume, but much of what comes up will not be helpful. Most countries are not as easy as Germany and Austria to buy Tracht, unfortunately. Macedonian Woman's costume Skopje Blatija early 20th century http://www.kijiji.ca/v-view-details.html? Wow! Very impressive. You're a wonderful resource. Great post Roman! Thank you! I also wanted to mention that it was a lovely surprise and an honour to see that two of the photo's you had used in your blog were of our dancers. Можеби подобро би било да осигурате г-дин Марко за автентичните докази пред да говорите нешто. Македонија е земја со автентичен македонски народ, македонско писмо, македонска традиција и изглед. 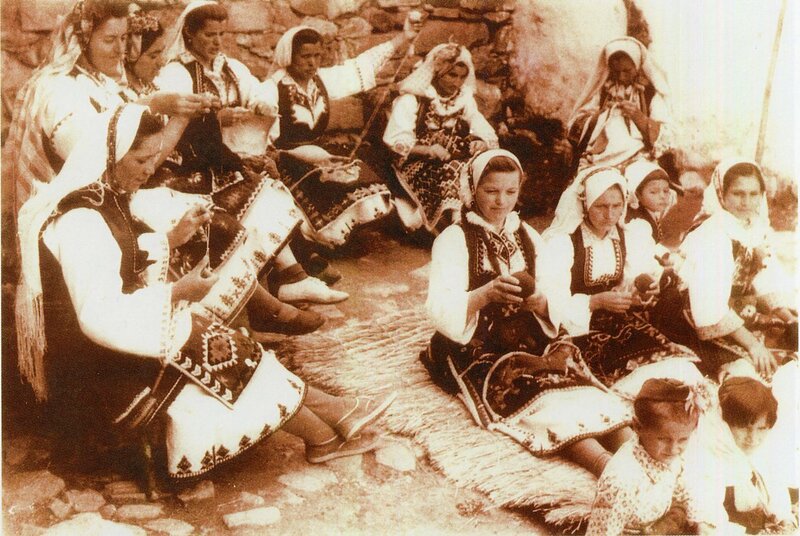 Грција е друга држава, а Античка Грција е нешто друго со сосема други факти. Физиономијата исто така говори кој на каде оди. Остри фаци, црномурести со изразени веѓи како грците, повеќе одат накај арапскиот муслимански дел. Кој како се претопил низ вековите, така сам си додава дури и вера. Ако сте вистински православци, нема погано да реагирате и напаѓате, туку ќе љубите. Вистинскиот христијанин љуби и страда од љубов, за да не наштети а научи на љубов и сподели љубов. Ова е на македонски. Престанете да не навредувате. Ако вие ни пресудите, Бог вам ќе ви пресуди еден ден.